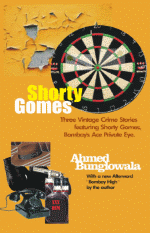 Shorty Gomes is a story of vintage Indian crime fiction, that comes our way from Bombay. In this metropolis, the crime nexus is apparent. It’s a mix of beautiful women, ugly politics, toxic godmen and soulless business. Ahmed Bunglowala’s fiction thriller will take you back to a city you might have known, or introduce it to you innovatively if you don’t know enough of Bombay. Shorty Gomes takes you on a fascinating tour of the crime nexus. Here, beautiful women, ugly politics, toxic godmen and soulless business are inextricably mixed. Deftly blending social comment and sardonic wit, these stories mirror the grim realities of the Big City, where everything is up for sale. Shorty Gomes is India’s answer to Philip Marlow. He has been plying his precarious profession from his flophouse in Dhobi Talao, Bombay, in the effervescent seventies and eighties. Goa,1556 was able to republish the title in a record time of three months, working through the monsoon. We are now looking forward to engaging the market for pulp fiction readers — especially the buffs of the hard-boiled school of detective fiction made famous by writers like Dashiell Hammett and Raymond Chandler. Ahmed Bunglowala, in a modest way, is a pioneer of this genre in India. He was born and grew up in Bombay (now Mumbai), a city he knows intimately. A city which can fascinate and frustrate in the same breath. After graduating from St Xavier’s College (in Bombay), he tried his hand at various jobs till he found his stride in the make-believe PR profession. He is a self-confessed buff of detective fiction. He has lived and worked in Pune, and now has settled in Goa with his wife and three dogs, acquiring a taste for feni and fish-curry rice. Three of the stories were first published in 1993. The fourth story appeared in an anthology in 2012. The Goa,1556 reissue has a new Afterword ‘Bombay High’ by the author. It refreshes the context of this engaging work of crime fiction. This project was made viable due to the crowd-funding support of friends, fans and well-wisher. Their contribution has been acknowledged in this book. The book is now available at outlets in Goa — among them the Golden Heart Emporium in Margao — besides via mail-order everywhere.